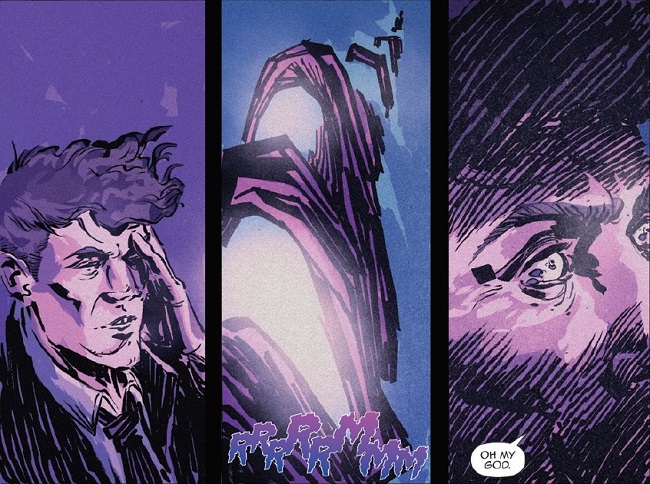 This issue of Roche Limit: Monadic, by Michael Moreci, Kyle Charles, Matt Battaglia and Ryan Ferrier, gathers the disparate threads of the narratives created on not-Earth and beautifully, messily tangles them together. 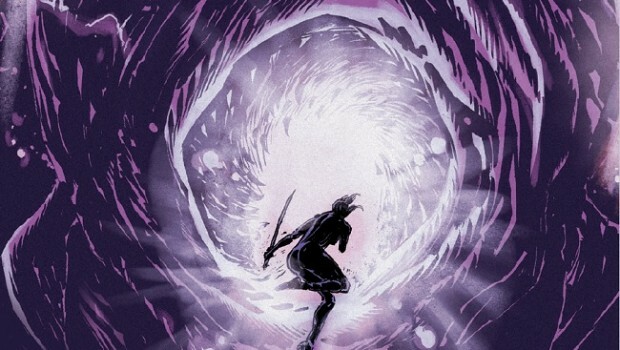 As Alex searches for the Black Tower, Sasha attempts to leave the secluded shore with its anchoring constructs, and Sonya is instructed by Watkins on how to prevent an alien invasion of Earth. By the end of the issue, events are gravitating towards each other, in some cases, hurtling together, and the ensuing collisions are not looking pretty. Kyle Charles’ art is particularly strong in this issue in creating an environment of confusion and delusion in the chimera of not-Earth. Thick shadow-lines weigh oppressively on characters, and backgrounds appear fractured as if one could almost peer through the gaps. The noir character of the book is troubled, its visual cues contorted in genre mash-up with horror and sci-fi. And yet, what’s most troubling about it is that it looks real. Although desolate, the illusion of reality created by the anomaly appears realistic, and isn’t that far off from the appearance of the Roche Limit colony. This is where Matt Battaglia’s colours come into play. 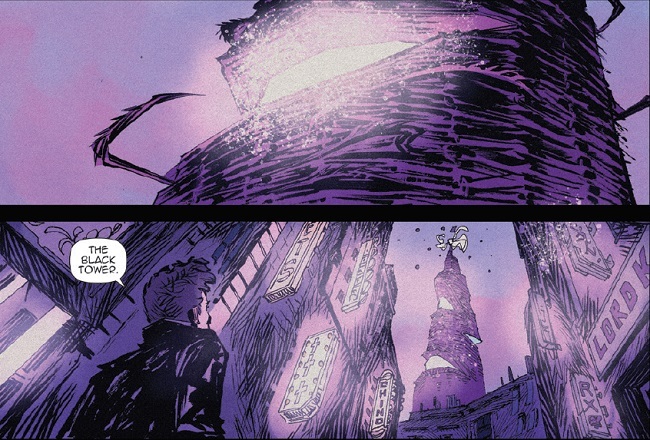 The city inhabited by Alex and Sonya shares in the muted yellows and greens of Roche Limit, but in sight of the Black Tower, everything is bathed in the purples of Clandestiny. Meanwhile, Sasha’s scenes recall the idealistic appearance of illusions created by the anomaly, heavily saturated with light, emphasising the inviting and comforting power of the illusion that Sasha is having to resist. I’m interested to see how the colour of her scenes will progress next issue, as she is drawn further into the story along with the other characters. 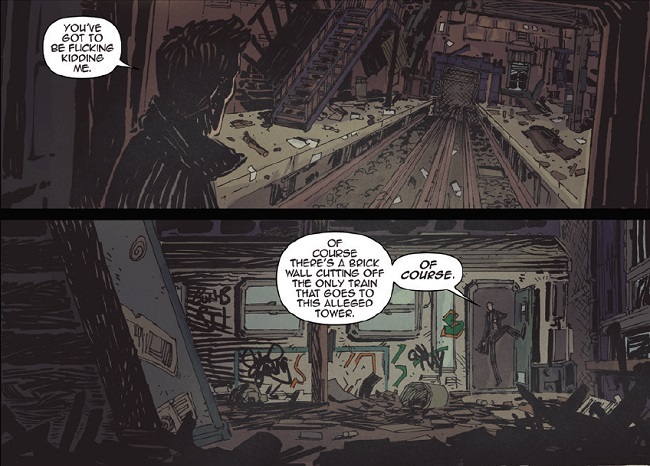 The other narrative cue of this issue is the souls taken by the anomaly. The aliens of the Black Sun want the thing that makes us human and unlike anything else, represented by hundreds of glowing orbs, the same orbs that trapped Bekkah’s soul when she was exposed to the anomaly. 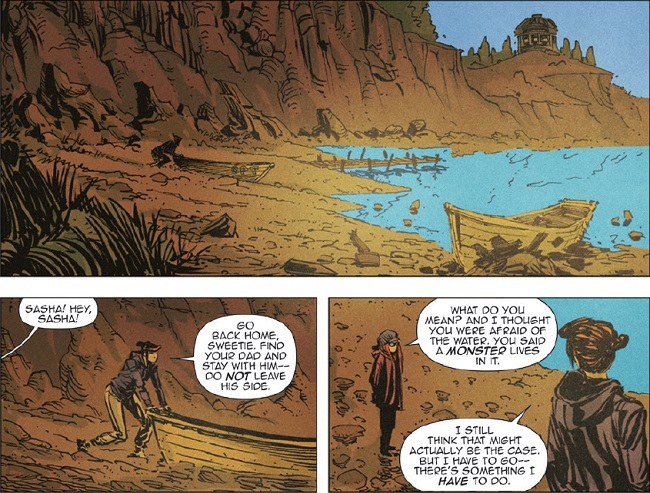 Alex’s sacrifice on Roche Limit makes him unique in the alien’s limited understanding, and so the fake Earth seems to be a construct in which the aliens play out stories in order to understand elements of the humanity that escapes their grasp. When they have succeeded in corrupting and incorporating the soul into themselves, they will become unstoppable. There is a lot in this issue to unpack; it is dense, both stylistically and narratively, from Sasha’s ocean-side reverie, to Alex’s discovery of the Black Tower, to Watkin’s instruction to Sonya to find and defeat the evil of the story at its source. Structurally, as this issue drives the narrative forward, the creators do an excellent job of balancing and complementing the individual threads of the three main characters in what is possibly the most stylistically diverse of all the issues so far. Next issue, we might expect to see these differing styles being brought together as elements of the story start to collide, a feat that might, perhaps, be challenging but I don’t think overly so for a book that has already proven itself to be adeptly genre savvy. With only two issues left in the series (not five, unfortunately), what I’m looking forward to is the melding of story elements that have been carefully cultivated over the last year; that and answers. While this book is a beautiful study in science fiction, horror and noir detective stories, it is at its heart a mystery, and an exploration into what makes us human and how we dream. It examines the mistakes we make, and why we repeat them. And it takes a hard look at our ambitions, our regrets, and our illusions. And as much as I anticipate the conclusion to this story, I will be sorry when Roche Limit: Monadic is over, mostly for the beautiful way in which it posed questions and interrogated and delved into the mystery of what we humans are.